The process of evolution tells us that dogs developed as carnivores. Wolves are still carnivores and relatively, dogs were still wolves until very recently. So in theory, should not our dogs still be strict carnivores, craving protein and fibre and dreaming of hunks of juicy beef? The majority of people still view the dog as a solely carnivorous feeder, but in reality the modern dog is a versatile and healthy eater. The nutritional needs of the dog have changed since his domestication; as a consequence, so have his dietary needs. Most dogs have swapped the baron fields of Europe for the comfort of a basket or bed in a heated house. Dogs are less active nowadays too; they do not need to hunt so they need less energy. Most dogs get used to getting fed and acquire tastes of their own. So they tend not to gorge in order to stock up, they can afford to be more picky (this is rare, however; most dogs will still try to stuff themselves, but they no longer need to). Already we can see three reasons why the canine diet has changed. They no longer need large amounts of fat to stay warm, our houses do that for them; they no longer need huge amounts of energy to hunt with, so their need for protein is diminishing and they no longer need to gorge on a day’s worth of food. So is there anything they do need in their diets that they may not be getting? Well, due to the advancements in veterinary care, our dogs are living much longer. In order to do this and benefit from a prolonged lifespan, dogs would benefit from foods rich in omega 3 oils which promote healthy joints. Foods such as fatty fish contain high amounts of these essential oils, but surprisingly grass-fed beef is even richer in omega 3. Sensitivity is relative to ones surroundings. To some sensitivity is a matter of interpretation; in fact the French have one word denoting both ‘sensitive’ and ‘sensible’. You can be ‘a bit funny’ after eating dark chocolate or ‘disagree’ with curries, but you can still get away with it if you want. My eyes itch after eating bananas, but it’s bearable, but give someone with an allergy a nut and the situation could turn grave very quickly. Some dogs can have an intolerance or a reaction to certain food ingredients. By working closely with your vet, you can discover what that ingredient is and then change your dog’s diet accordingly. The intolerance or allergic reaction to a food ingredient is usually part of the protein content in the food and this can manifest itself as itching or in some cases diarrhoea. As you are responsible for the well being of your dog and responsible for the managing of his diet, you have to work with the vet in order to discover which ingredient is causing the problem. Finding the cause of the problem means that you can eliminate it from your dog’s diet. Simple isn’t it? It’s actually rather more serious than we think as a food allergy can have very severe consequences. Let’s start from the beginning and try to work out how we can help our dogs. A food allergy causes only 1% of all skin problems in dogs, that’s what vets’ estimate anyway. The majority of other allergic skin problems, such as an allergy to fleabites are much more common. It is hard to find exactly what percentages of gastrointestinal problems like vomiting or diarrhoea are caused by food allergies. 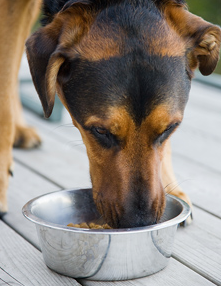 Dog owners often change the food that they feed their dog once one type of food is tolerated. A dog, which has skin that itches, as well as intestinal problems is more likely to have food allergies. There is a mystery surrounding exactly why a food ingredient causes the symptoms of food allergy. Some animal specialists suspect that abnormal amounts, or certain types of protein particles from food, are absorbed into the bloodstream from the digestive tract. The skin and the digestive tract may then become sensitive to food that contains that particular ingredient. The offending item is a ruthless one and a dog that has a sensitive reaction, such as itchy skin, vomiting or diarrhoea may start to suffer from these within minutes, although they can occur up to a few days later. It doesn’t help that the offending food ingredient is not necessarily something new in the diet. Your dog can develop allergies to foods that he has been eating for years, and the allergy may come on suddenly. Once an allergy has developed, the sensitivity to the ingredient may last a lifetime. It is important that foods containing that ingredient be kept out of your dog’s diet on a permanent basis. The Dog Food Project – How does your Dog Food Brand compare? For the 1st time in 35 years I now have a 1 year old labrador who sometimes does not eat! I feed Skinners Field and Trial 22% Protein at the moment, whereas the older dogs have Maintenance with 18% Protein which Flora (the 1 year old)dislikes even more. All dogs have raw veg on a regular basis, James Wellbeloved ‘treats’ and bonios at bedtime all consumed with alacrity.